*Vitamins C, E and beta carotene. What does your heart mean to you? At Kashi, we believe that your heart is the essence of who you are. It is the engine of your body. A healthy heart enables you to do what you want. It allows you to be there for the people you love. So it's worth taking care of. That's why we created Heart to Heart foods to give you more tasty choices for your heart. 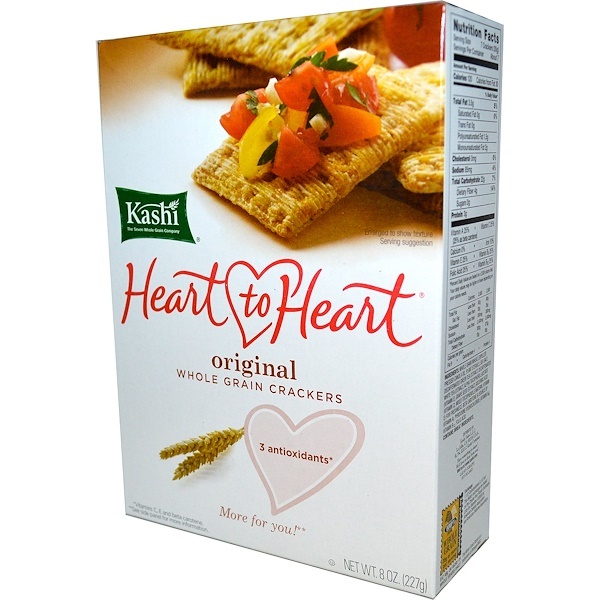 With Original Whole Grain Heart to Heart crackers, you'll savor every bite knowing that it tastes good and it's good for you. With essential antioxidant vitamins C and E, and a touch of sea salt, this crispy whole wheat cracker is a tasty way to do more for your heart. At Kashi, The Seven Whole Grain Company, we believe everyone has the power to make positive, healthy lifestyle changes. For over 25 years it's been our mission to provide great tasting, all natural whole grain foods to help you live well. High cholesterol is a major risk factor for heart disease. Natural compounds found in fruits, nuts and vegetables, called plant sterols, are believed to help block the absorption of cholesterol from food into the body. But it can be difficult to eat enough of these foods daily to achieve an effect. 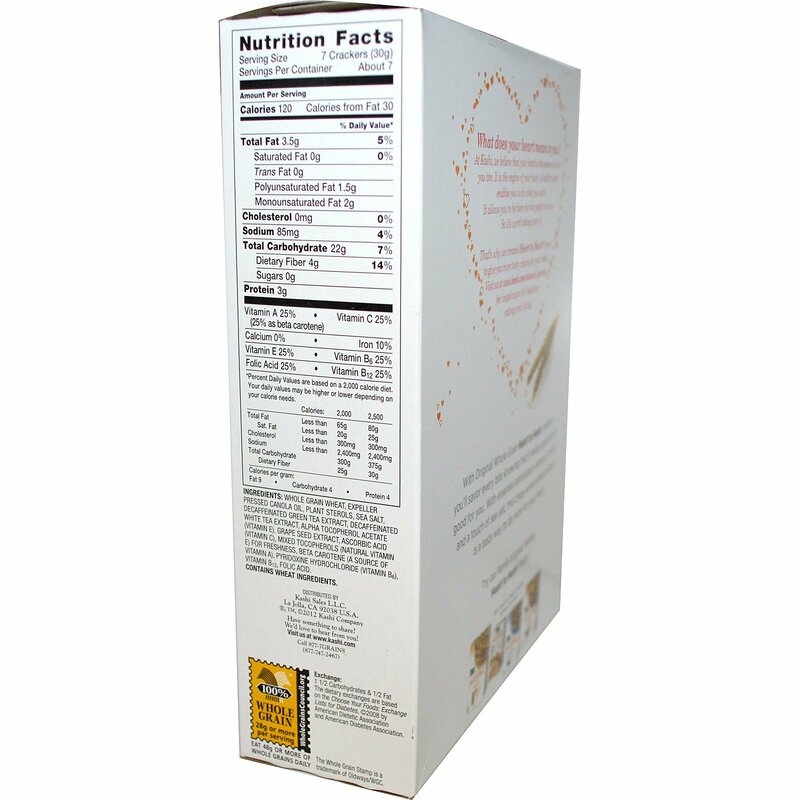 That's why we've included 0.4 grams of plant sterols per serving in Heart to Heart crackers. Foods containing at least 0.4 grams per serving of plant sterols, eaten twice a day with meals for a daily total intake of at least 0.8 grams, as a part of a diet low in saturated fat and cholesterol, may reduce the risk of heart disease. High blood pressure is another major risk factor for heart disease. Sodium is important to the body, but a high sodium diet is associated with hypertension. Diets low in sodium may reduce the risk of high blood pressure, a disease associated with many risk factors. That's why we made sure Heart to Heart crackers are a low sodium snack choice. Each serving of Heart to Heart crackers is high in antioxidant vitamins C and E. Plus, you'll get 25% Daily Value of heart healthy vitamins B6, B12 and folic acid. Whole grain wheat, expeller pressed canola oil, plant sterols, sea salt, decaffeinated green tea extract, decaffeinated white tea extract, alpha tocopherol acetate (vitamin E), grape seed extract, ascorbic acid (vitamin C), mixed tocopherols (natural vitamin E) for freshness, beta carotene (a source of vitamin A), pyridoxine hydrochloride (vitamin B6), vitamin B12, folic acid.